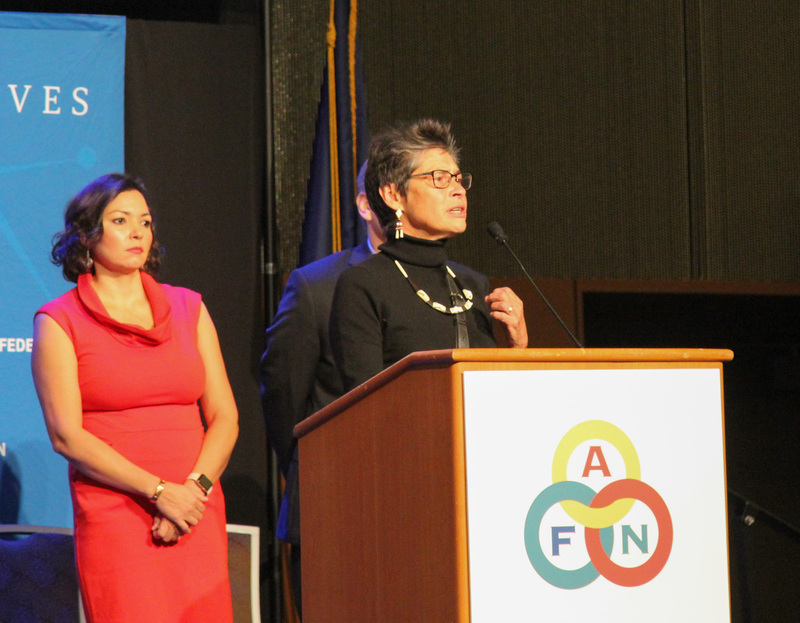 The Alaska Federation of Natives Convention is wrapping up its second day in Anchorage. This year’s theme is Innovation in the past, present and future. The issue of violence against women is at the forefront of the conference. Most of the day’s early speakers on the convention’s main stage gave updates on legal, judicial and federal issues affecting Alaska Natives. But some, like Cook Inlet Tribal Council’s Gloria O’Neill, directly addressed this year’s theme. “Innovation is at the core of how we not only survived, but thrived for millennia,” O’Neill said. O’Neill described CITC’s process for developing the 2014 video-game “Never Alone,” where players guide a young Inupiaq girl through an Arctic quest. O’Neill says the experience offers a template for taking Alaska history, stories, and talent toward emerging industries that benefit state residents and ANC shareholders. But for the last few days, the theme of defending Alaska Native women from sexual violence has been more prominent than just about anything else. During an update from the Alaska Native Justice Center, prominent attorney Heather Kendall-Miller alluded to the recent Justin Schnieder case appealing to groups like AFN to push for criminal justice reforms. Kendall-Miller called for reforms in how sexual assault cases against Alaska Native women are investigated and prosecuted, and for an increase in the State of Alaska’s accountability delivering justice to victims. The morning also saw remarks from Congressman Don Young, who championed his record delivering results to Alaska Natives in the capital, and asked for their support in the November election.